Have you heard of Susan Boyle? Here is the first time she sang. She sings "I Dream A Dream" from Les Miserables Here is an original version. And here is the season finale. The song is "Memory" from the musical Cats. You can listen to the original here. I used to watch the Apprentice, but missed this entire season. I wish I had recorded it. Here is a snippet of Joan Rivers ranting about Poker players.. Annie Duke was on it and made it all the way to the finals. In then end, Trump picked Joan Rivers. Well, I couldn't stand losing that bad beat hand the other night. 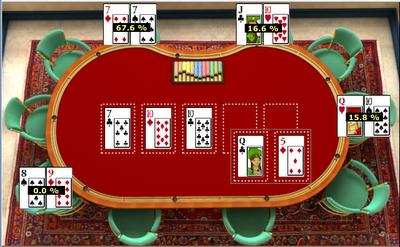 I flopped a boat with pocket 7♦,7♥ and another guy turns a bigger boat with Q10. What I didn't mention was during another hand, that same night, I had pocket kings and some girl (along with 2 other guys) called my preflop bet of $55 with Q10. There was a Queen on the flop. I bet $75 and she still called. I checked the turn and river where another Queen hit. She went all-in for another ~$60 and I folded. She showed Q10. I figured if she called $75 , then she is a donkie and you know the saying, "dont try to bluff an idiot". I am with Phil Hellmuth, you are an idiot to call a raise with Q10. Anyways, I decided to visit a $1/$2 game with $5 to come in. It is a little bigger game and felt I was still on a heater. Within 2hrs, I had 9 large pocket pairs the previous night before and it just seem like it wouldn't end. I just hoped that no one got lucky on me again any more. My feeling was right. Last night was a continuation of great cards. Within the first hour I had Q♥, Q♣ A♦, A♥ K♠, K♥ and Aces again. I won all the hands. I finally hit a set of fives and won that hand to a guy with A9. Then I get Aces again. The guy I hit my set against, short stacked now, called my $55 pre-flop raise. He spiked his set of nines on the flop. Luckily, he only had another $60 to left. Bad Beat city... Got awesome card for the first 20mins of play, and then this bad beat.. I had pocket 7♦,7♥ and the the pot ended up being around $600!!! Ouch!!! Luckily I was the chip leader and didnt bust out, but it still hurt.. These were the hand I had during the 3 hr session. We ended early after a cop showed up at the door and people decided to hit and run..
Been back to Michigan for work for the last couple of weeks... Visiting my old Poker places. It started out slow, but didn't lose any money yet. In my first session, I hit a set of 777s to a guys KQ. The flop was K73. The turn was a Queen and all the chips went in. The river was another Queen.. Ouchhh.. I made my stack back and managed to win $40 for the night.. 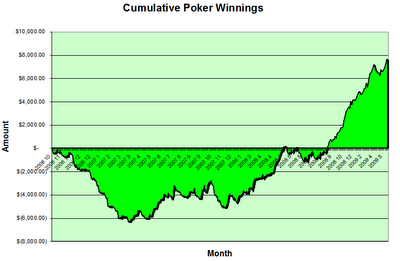 Since then it was solid poker and now I am up over $850 for the month. I played some Omaha at Shark's Club and hit another set of 777s. This time they held up and 2 people called my all-in of $150 on the flop... That put me over the top for the night and I never looked back.. I also hit a straight flush that night with 74 suited in hearts. It was only my second straight flush since hitting a Royal Flush a while back.